Summary: Transamerican Auto Parts is preparing for the expected January opening of the largest of its six Nationwide distribution centers in Carlisle, Pennsylvania with Job Fair this Wednesday and Thursday, September 20-21. This distribution center is expected to bring 70 jobs to the region in addition to the anticipated 4 Wheel Parts Retail store. The first of 83 such stores in Pennsylvania. While sharing this news with your audience, we invite you to cover this event as a local business story. Transamerican Auto Parts Director of Human Resources, Randy Krzesinski will be on-site and available for interviews regarding the new distribution center and this regional jobs creation initiative. Compton, California (Sept 19, 2017) – Transamerican Auto Parts (TAP) is holding a two-day Job Far to staff their soon-to-be-open distribution center, retail and wholesale operations in Carlisle, Pennsylvania. This major expansion of the Nation’s leader in the distribution and sales of off-road aftermarket and performance parts and accessories creates the need for qualified applicants from the local region to fill more than 70 positions. The variety of available positions in the distribution center include Wholesale Sales, Quality Control Representative, Export Coordinator, Facilities Maintenance Coordinator, Material Handler, Administrative Assistant and General Warehouse personnel. This addition to Transamerican’s five national distribution centers will be the cornerstone for the expansion of the company’s northeast wholesale and retail sales and distribution operations. 4 Wheel Parts retail customers will realize significant benefits as a result of this new distribution center such as reduced freight costs, more economic delivery and in many cases, next day pick-up of the majority of product categories in regional retail stores. The location is also projected to be a site for a future 4 Wheel Parts retail store location adjacent to the distribution center which will join the roster of over 83 North American locations. The two-day Job Fair event will be held at the Comfort Suites in Downtown Carlisle this Wednesday and Thursday, September 20-21. Representatives from the TAP Talent Acquisition Team will be onsite from 10 a.m. until 2 p.m. and from 4 p.m. until 8 p.m. each day to meet with applicants. “This is a great opportunity to grown with us be part of a new, exciting future,” concluded Krzesinski. Hours: Wednesday, September 20 from 10 a.m. – 2 p.m. & 4 p.m. – 8 p.m.
Thursday, September 21 from 10 a.m. – 2 p.m. & 4 p.m. – 8 p.m.
Compton, California (September 13, 2017) – 4 Wheel Parts, the global leader in off-road performance product sales and installation, is officially opening the doors to its newly relocated and remodeled location in Indianapolis, Indiana this Saturday, September 16th. Highlights of the family-friendly event, located at 7535 E. 88th Place Indianapolis, Indiana include one-day-only discounts, installation specials along with multiple promotions and giveaways as 4 Wheel Parts unveils their new state-of the-art showroom and service area to the community. The store opens its doors to the renovated showroom presenting guests their first chance to experience this premier off-road shopping environment while interacting with the team of off-road performance experts throughout the day. Representatives from many of the industry’s leading manufacturers such as Rubicon Express, Poison Spyder, G2 Axle and Gear, Pro Comp, Polaris, Wheel Pros and BFGoodrich, will join in the celebration with product displays, give-a-ways and demonstrations. Additional prizes courtesy of Interco Tire, Toyo Tires and Currie Enterprises have been added to the growing list of products to be given away that include Pro Comp off-road lights and a $500 4 Wheel Parts Gift Card. The day-long event will feature monster trucks, a live band and a mechanical bull in addition to games and activities for children, including two bounce houses. The Marine Corps League will be serving lunch for attendees while Squealers Restaurant is providing sliders in the evening. Off-road enthusiasts from throughout the region are expected to join in the celebration including members of the Mutiny Off-Road Club. When: Saturday, September 16th – 9 a.m. – 10 p.m.
Compton, California (September 8, 2017) – 4 Wheel Parts, the global leader in off-road performance product sales and installation, is celebrating the opening of its newest location this Saturday, September 9th in Cincinnati, Ohio. The family-friendly festivities, located at 11350 Princeton Pike, represents the introduction of the off-road aftermarket retailer’s 83rd North American location. The day will feature exclusive grand opening discounts, installation specials, numerous special promotions and giveaways as 4 Wheel Parts unveils its unique off-road shopping concept to the community. The grand opening offers attendees the chance to engage with the entire staff of off-road performance specialists who will be onsite to provide their expertise. Many of the industry’s leading manufacturers such as Pro Comp, Rubicon Express, Poison Spyder, G2 Axle and Gear, Wheel Pros, Polaris and BFGoodrich, will also be on-hand with product displays and demonstrations. The event will also feature custom vehicle displays, a live DJ, games and activities, catering by TGI Fridays and Monster Energy Drinks. Off-road enthusiasts from throughout the region are expected to join in the celebration including members of the “Cincy JK Crew” Jeep Club. Numerous raffles spearheaded by Cincinnati based, Cancer Free KIDS will be held during the day that will offer visitors a chance to enter to win a number of giveaways and promotions. Up for grabs will be 4 Wheel Parts Gift Cards, prizes from Rigid Industries and Bestop and a $1000 4 Wheel Parts shopping spree. 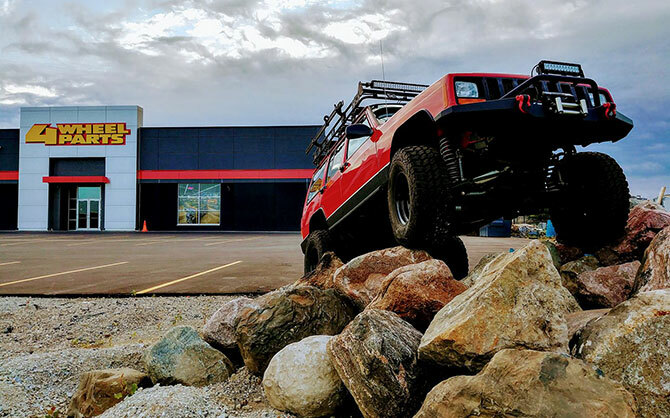 When: Saturday, September 9th – 9 a.m. – 5 p.m.
4 WHEEL PARTS OPENS OFF-ROAD RETAIL STORE IN BROOKLYN PARK, MN. 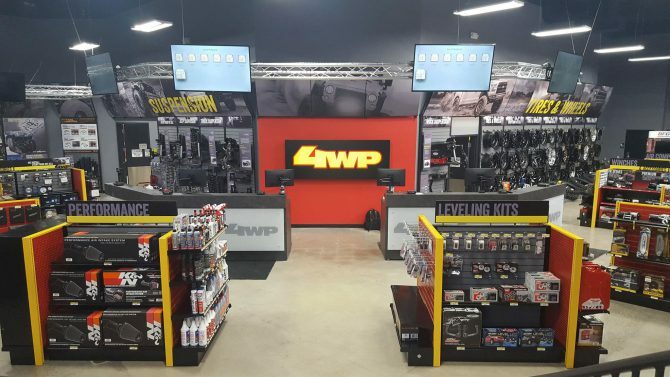 Compton, California (July 14, 2017) – 4 Wheel Parts, the global leader in off-road performance sales and installation, has opened its newest retail store on 6771 Boone Avenue North, Brooklyn Park, Minnesota. The Brooklyn Park location represents its 80th in North America as 4 Wheel Parts advances its expansion objective of 100 Locations by the year 2020. While customers are invited to visit and start shopping now, the store will hold its official Grand Opening Celebration on Saturday, July 22 at 9 a.m. The free Grand Opening event will feature special one-day discounts, installation specials and multiple giveaways throughout the day. 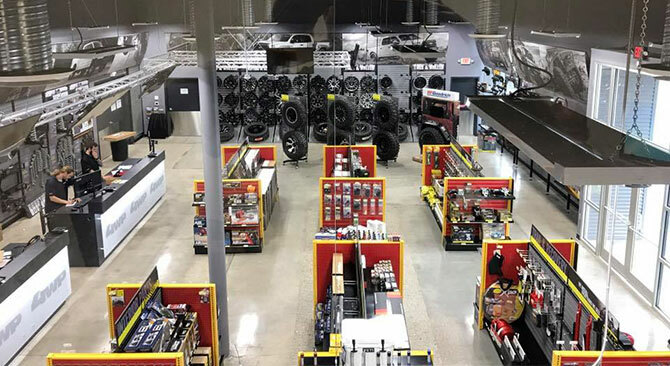 As the first off-road superstore of its type in the region, 4 Wheel Parts – Brooklyn Park presents a unique aftermarket parts and accessory experience with a modern design showcasing the industry’s widest selection of aftermarket and performance products in an interactive environment. Complementing the state-of-the art showroom is a complete eight-bay service center, staffed by ASE-certified technicians. In addition to the comprehensive selection of parts and accessories, the store is manned by an expert staff to provide customers with the proper guidance. “The Brooklyn Park team are enthusiasts themselves and while they spend their weekends outdoors and on the trails, they truly enjoy taking the time to work with our customers to help them make the right purchase decisions for their Jeeps and Trucks,” said Store Manager, John Tague. The immersive, floor-to-ceiling displays cater to an off-road enthusiast clientele looking for the latest in performance, suspension, wheel and tire upgrades for their off-road vehicle while also providing every day answers for Jeep and Truck owners looking for floor mats, towing, safety and security items for their vehicle. The new Brooklyn Park location also joins a select number of 4 Wheel Parts stores chosen to carry a broad collection of premium, aftermarket products for UTVs including the Polaris RZR. “We know that now more than ever, our customers have a choice where to shop for parts and accessories for their vehicles. With our showroom and installation center, along with the excellent staff we have here, we are proud to provide the region with a singular solution to their off-road retail needs,” stated Tague. When: Saturday, July 22 – 9 a.m. – 5 p.m.
4 Wheel Parts is the global leader in truck, Jeep, SUV and off-road performance products. With 80 locations across the U.S. and Canada and growing, 4 Wheel Parts Service Centers install all the products they sell. Maintaining the nation’s largest inventory of off-road tires, wheels, suspension products and accessories, 4 Wheel Parts serves customers across the country and around the globe. Life is Better Off-Road™. Visit them at 4wheelparts.com or call toll-free 877-474-4821. Compton, California (June 14, 2017) – 4 Wheel Parts, the global leader in off-road performance product sales and installation, presented a check in the amount of $30,872 to the Off-Road Business Association (ORBA) as part of its “Round Up” charitable fundraising initiative. The “Round Up” initiative served to raise funds to support the foundation’s goals of promoting, preserving and expanding meaningful off-road recreation on public and private land. Led by 4 Wheel Parts Regional Manager, Jeremy Komorn, the full roster of 80 stores across North America supported the successful campaign by providing customers the option of rounding up to the next dollar at checkout with the proceeds to be directly contributed to ORBA. The Off Road Business Association is an International Trade Association, comprised of member businesses ranging from large, international corporations to rural family run businesses. ORBA provides leadership and advocacy for the preservation of motorized access and the future of off-highway vehicles. All monies collected were directed to the nonprofit trade organization to further their objectives. 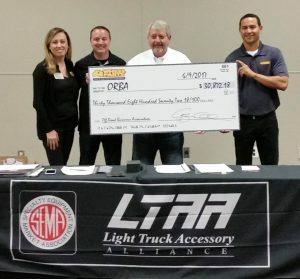 The presentation was made this past Friday at the Light Truck Accessory Alliance (LTAA) meeting and luncheon held at the Ontario Convention Center by LTAA Chair, Kathryn Reinhardt and 4 Wheel Parts executives, Brent Goegebuer and Sam Cervantes. For more information about the Off-Road Business Association, make a donation or to become a member please visit http://www.orba.biz. 4 Wheel Parts is the global leader in truck, Jeep, SUV and off-road performance products. With 79 locations across the U.S. and Canada and growing, 4 Wheel Parts Service Centers install all the products they sell. Maintaining the nation’s largest inventory of off-road tires, wheels, suspension products and accessories, 4 Wheel Parts serves customers across the country and around the globe. Life is Better Off-Road™. Visit them at 4wheelparts.com or call toll-free 877-474-4821.